Shan). Wu Tai Shan can be reached by train from the South through TaiYuan, or from the North through Datong, both in Shanxi Province. many recruits from all over North-China. behind the newly built and connected Great Wall, the city was allowed to develop further and became a flourishing trading post, market and stop-off point for trading caravans on the Silk- (and Tea-) Road leading to Mongolia, central asia and beyond to the West . Much later, during a decline of China's Central Powers, North-China was over-run and unified under the flag of the turkmenic Toba Tribes. The resulting 5Th Century Northern Wei Dynasty (364 AD - 584 AD), chose Datong as their Capital of (unified) North China. During this period, the small city grew immensely in importance and became a flourishing city on the Silk Road along which buddhist influences were carried into China (and in the following period beyond). Its new status as Capital City turned Datong into a center of culture and buddhist learning. In this prosperous era many monuments were erected in the City by the ardently Buddhist Toba to glorify their Capital as well as their Emperor who was perceived to be a reincarnation of the Buddha. 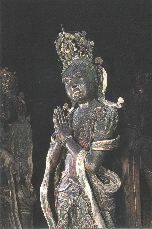 As a result the nearby Yungang village (west of Datong) with its Caves were constructed and became an important Buddhist site and Monastery, growing slowly -over a period of 50 years- into a multitude of Caves with thousands of smaller and larger Buddha images and Statues locally known as Cloud Ridge Caves. At Yungang and Datong the influences of the Silk Road (Buddhism from India) and the chinese traditions of Daoism and Confucianism were combined and mixed to form the Mahayana form of Buddhism now prevalent across East Asia. The Yungang grottoes would remain an important Monastery and Holy Site for ages to come, equalling Dunhuang (Gansu Province, west-China) and the Bamiyan statues of Afghanistan (now destroyed by islamic religious zealots). The Toba left in 494 AD, moving their Capital to Luoyang in Henan Province, carving out a new Maze of Buddhist Caves there. Bhagavan Stack Hall , home to the scriptures library at the Lower HuaYan Monastery. 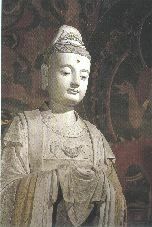 Original 10-to 12Th Century AD Clay Buddhist statues of the HuaYan Monastery. 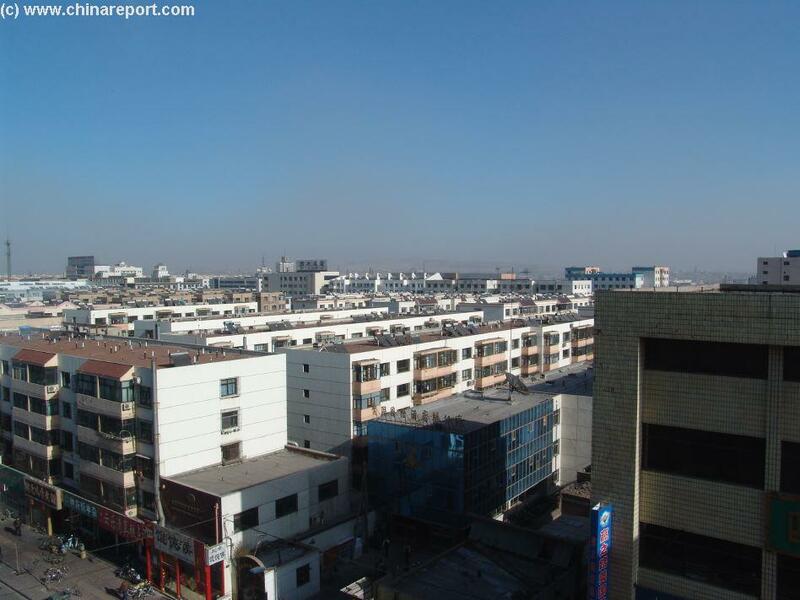 Overview of modern housing and buildings in Datong's modern City with windblown Yellow Dust and Northern Hills in the background. 12Th Century statues of the Upper HuaYan Monastery Main Shrine Hall. Close-Up of the Central Portion of the Screen and arched entry Bridge. Read all about the Battle for China between Mao & Chiang Kai Chek and the achievements of the Communist Party in (US Marines) Major-General Evans F. Carlson's bestseller Twin Stars of China. A unique eyewitness account from the frontlines in North-China -Shaanxi, Shanxi and Ningxia - Travel with the Red Armies in their War against Japan. 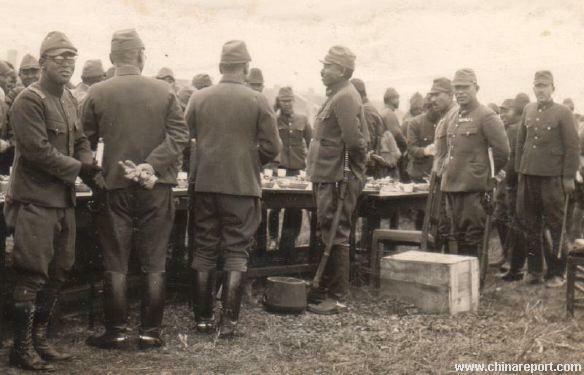 Japanese Officers discussing strategy at a field post. 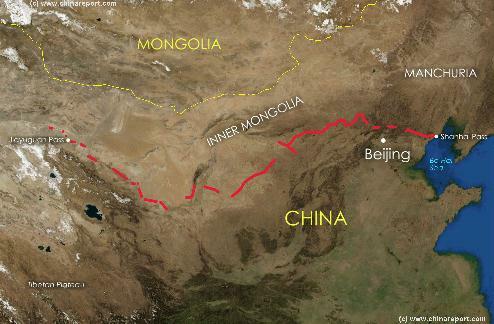 A Satellite image of North China and East-Asia, showing clearly the strategic position of Datong in relation to the Great Wall of China. Super-imposed schematic Map shows the location and Path of the Great Wall as excisted during the Reign of the Ming Dynasty. Included for reference are City names, geographical features of landscape, Names and locations of Passes on the Great Wall of China. Only after the introduction of trains and railroads in China during the last throws of the Qing Dynasty and the connection of Datong to China's railway system (Ping-Shui R.R. ), the position of the city changed once more. Datong grew in size and became an industrial city and transportation hub of raw materials (Coal mainly) and machinery. with Mongolian "rebels"), Datong became a main focal point of military action. invasion never reached its next target the City of Xi'An (in Shaanxi. leadership started planning for a strategy for all of China. It would still be a long struggle to realize their ideal of a New China. 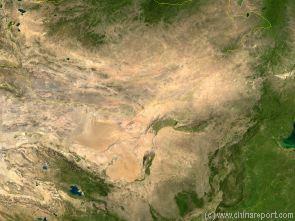 A Satellite Image based Map of the Gobi Desert and the Flow of the Yellow River clearly showing Datong's strategic and geographical position. Post-Revolutionary Datong - After the second world war, the subsequently re-started civil war and the establishment of the Peoples Republic of China in November 1949 AD, Datong was once again forgotten and only grew as one of the industrial centers of the North. As a side-effect of this, its railway facilities were greatly expanded and improved and a new Railway Station was constructed. Datong, as were other cities in the area, was turned into a model worker city and during the Cultural Revolution Era the City was a much propagandized bulwark of socialism, a period from which slogans on many walls in and around the City bare witness. Its function as the coal supplier of China's industry would determine its Future. In the 7Th century Datong briefly became the Capital City of the Chinese Sui Dynasty. The Sui Dynasty is considered another highpoint of Chinese Civilization in which culture, art and science flourished. During this period the succesul Han Chinese of the fertile plains and valleys found themselves again under mounting pressure from raiding tribes in the North. As an answer to this age old poblem, the now more technology advanced Han started rebuilding their Great Wall of China. The First and foremost issue in the lingering conflict with the Northern Tribes was the securing of the (many) mountain passes along the border and therefor Datong, as one of the main "Pass Cities" set in the middle of one of the main routes from Mongolia into the Chinese heartlands, was chosen for an increase in its defenses. During the short period of the Sui Dynasty, the city of Datong was given an earthen defense wall, and furthermore the passes leading to the City saw the building of more defensive walls, beacon towers and fortified castles. In the Sui Dynasty Era Datong was turned into a true Fortress City for the first time. The City was the central fortress and garrisson station on the region, and so became the pivot of the larger defenses of the Great Wall of China in the area. Henceforth Datong was not merely be a trading post but a fortified border city and garrisoned outpost of Chinese Culture. Datong however was not the main historic Capital of the Sui Dynasty. After their take-over of power over China and re-uniting South and North, the Sui once more moved the Chinese Capital. It was moved from Datong southward and away from the threat of invasion, back to Chang'An (Xi'An, Shaanxi Province) where the Zhou Dynasty (1121 BC - 255 BC), the Qin Dynasty (221 B.C. - 207 B.C.) and the Han Dynasty (206 B.C. - 220 A.D.) had had their Capitals. Situated at considerable distance to the south and west, the City of Chang 'An was in a postion much closer to the economically crucial Silk Road which became of vital importance during the onfollowing Tang economic golden age. The location of the old Capital of China was also closer to the Yellow River (Huang He) and the Grand Canal, which had been renovated and extended during the Sui Period and was an essential internal conduit of goods, money and thus power. Naturally safety from a Northern invasion was another valid concern. DATONG DURING THE TANG DYNASTY (618 A.D. - 907 A.D.). The Sui Dynasty was succesful in uniting and reorganizing the Chinese Empire but in the end overburned the population with heavy taxations and obligatory (hard) labor for the State. It thus ended in a rebellion and was followed by the Tang Dynasty ( 8Th Century ). During the Tang Dynasty and afterwards Datong remained what it was - an important outpost on the outer ring of the Great Wall of China and a border City on the road to Mongolia. Although Datong would remain important as conduit for trade and the commercial expansion of Han Chinese merchants to the northern territories, it would gradually lose in military importance. As the Tang Dynasty Empire expanded further an further into Asia and peace was kept with neighboring tribes, the Great Wall and its defenses seemed less and less important. The Great Wall built mainly during the short Sui Dynasty Era was neglected completely during the "Golden Century" of the Tang Dynasty, which only expanded the number of beacon towers along the old line of defense. When the Tang Dynasty Era and slowly drew to an end, and the borderlands were left uncontrolled, this left the City of Datong dangerously exposed. stronghold in the defenses of the Northern Border. Armies. Although by then protected by high mud-brick defensive Walls, the City was taken and the Mongolian armies led by their leader Altan Khan moved on to threaten Beijing. Because the Mongolians wanted trade and had felt they had to resort to military pressure to have their way, they never intended to take the Capital and conquer China. The event was however yet another reminder of the nasty nature of the northern neighbors. In the aftermath, the Great Wall at Datong and in adjoining regions was rebuilt and further fortified. By the end of the 16th century the decline of the Ming Dynasty had eroded the influence of the central Government in Beijing enough for local Governors to collude with Mongolians and ignore the cross-border trade ban with the Mongolian Territories. It was in this time that things started to calm down in the border regions along the Great Wall of China, and thus for the time being Datong embarked upon a relatively peaceful period. In the year 1571 AD, a new Emperor made a ground breaking change of policy finally and openly allowing for trade relations to be established with the Mongolians. The (nearly) complete ban on trade, inherited from the early Ming hatred for the Mongols of Yuan Dynasty and the fear of their return, was done away with and instead, a very limited and thus controllable system of trade through "horse markets" to be established. It was to prove a momentous decision. Among the four "pass cities" of the Great Wall of China designated to be opened, periodically, to allow trade with peoples outside the Great Wall of China was Datong. The other cities were neighboring Zhangjiakou to the east, which soon became the number 1 market, and to the west, the Yulin Fortress in Shaanxi Province and further a place in Gansu known as Xuanfu. Obviously, this reversal of the trade ban suddenly flung Datong into the limelight and increased its importance. Where previously it had been a costly fortress and garrison city on the "impenetrable" Great Wall, it now suddenly became a gateway to the outside world. It also grew in importance as regional market for goods. Although by far most of the trading was done through the "Gate to the Great Territories" at Zhangjiakou, Datong nevertheless became a focal point for the exchange of mongolian horses, sheep, wool and animal furs against Chinese goods such as silks, laquarware, metal pots and cooking implements and more. Twice year, and spring a fall the "horse market" would open and as a result, the town saw a considerable growth spur. For the border regions, especially those in the west, a period of weak defenses fell in with the collapse of the Ming Dynasty. The Manchu take over of 1644 AD spelled a disaster for Datong. The city of Datong, by then a lucrative economic target due to the presence of its "horse market" fell again to an invasion of Mongolian hordes. In 1649 AD Datong, the border city was sacked and nearly raised to the ground. The City and Palace were destroyed, leaving the Datong 9 Dragon Screen as one of the few remaining structures. to the Silk/Tea (North) Route) on the Great Wall of China. Northern territories through the Centuries. special program and cultural performances hosted by the City Government and Shanxi Province Tourism Agency..
the Communists "Peoples Liberation Army" which held large swaths of the poor Chinese countryside, re-ignited once more across China. In July of 1946 AD a full-scale battle roared up in North Shanxi Province around the Nationalist stronghold City of Datong and the (now) Inner Mongolia Autonomous Region around the City of Jining (Ulanqab). In the event the City of Datong was attacked by a large but ill-equipped and trained communist force and besieged for about a month. Although the defenders were forced inside the historic city wall, and the train station on the north-western outskirts was taken, the KuoMinTang City Garrison held out until relieved in September by KuoMinTang allies. The Battle for the City had costs around 14000 Chinese lives, of which a "mere" 2000 on the communist side. Nevertheless, the communist forces lost their most valuable veterans and would have to retreat for the time being. Today's Datong - locally also known as Mei Du, the Coal Capital, is a mainly industrial city that recently jumped from a citizenry of around 270.000 inhabitant to 960.000 in 2005, most working in the (Coal) mining and related industries. Urbanization of the fragile Chinese Inner-land continues with migrants continuing to leave the country-side bound for the City. Recent numbers suggest migrants have swelled the city to over a million citizens. Pollution is a big problem in Datong. In 960 AD, several decades after the final end of the Tang Dynasty (618 A.D. - 907 A.D.), another raiding tribe descended from the North and Datong fell into the hands of the Khitans (Yurchen). These, a mongolian nomadic and warring tribe that worshipped the Sun, had shortly united the North and founded the Liao Dynasty (907-1125 AD). Under the Khitan Rule Datong, as an important stronghold, became the second Capital of the Nation taking a strategic position within the now united Northern Regions. The Liao Dynasty disappeared after two centuries, but not without leaving their mark on the City of Datong and in fact all of Northern China including the City that is now known as Beijing. None of the buildings of the Liao Dynasty Era have survived time, mostly due to later wars that roled over- and past the City. However, great cultural and historical relics from the Liao Dynasty period remain in the shape of Clay Statues inside the Huayan- and Shan Hua Monasteries. As an important outpost and strategic strongpoint it was immediatly rebuilt (1652 AD) by the newly established Qing Dynasty (Shu Tzi reign period). gradually eliminated, expanding the Manchu Qing Empire thousands of miles beyond the initial border, along which lay also the city of Datong. Although this enormous military victory and political event resulted in the cancellation of the cross-border trade arrangements through "horse markets" that had been so lucrative for the local economy of the city of Datong, the following period would introduce new, even wider ranging opportunities. Starting in the beginning of the 18th century Datong retained an economic position as an important (and traditional) stop over point, on now much extended trade routes to the Manchu army bases established in Hohhot, and in Uliastay and Khovd in central- and west Mongolia (See adjacent map). regional gathering point for tea, which was then shipped to Mongolia on camel caravans which routed either through Hohhot and Baotou to central and west Mongolia, or from Datong through Ulanqab (today: Jining, Ulanqab League of Inner Mongolia Autonomous Region) northward across the steppes to Ulaanbataar and Khiakta. 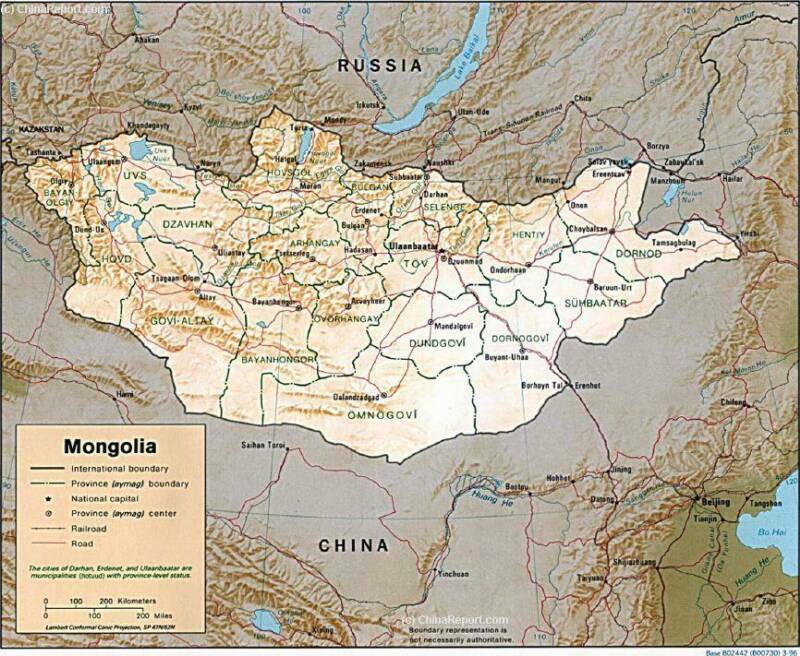 Eventhough the main shipments were sent from Beijing - as an issue of the Imperial Court, the safest routes to Mongolia were still determined by the trusted old habits and not unimportantly the function of local authorities. Thus, the caravans stayed within the relative civilization and safety of the age old Great Wall of China, and routed from Beijing through Zhangjiakou (Kalgan) and its neighboring Pass City, Datong.